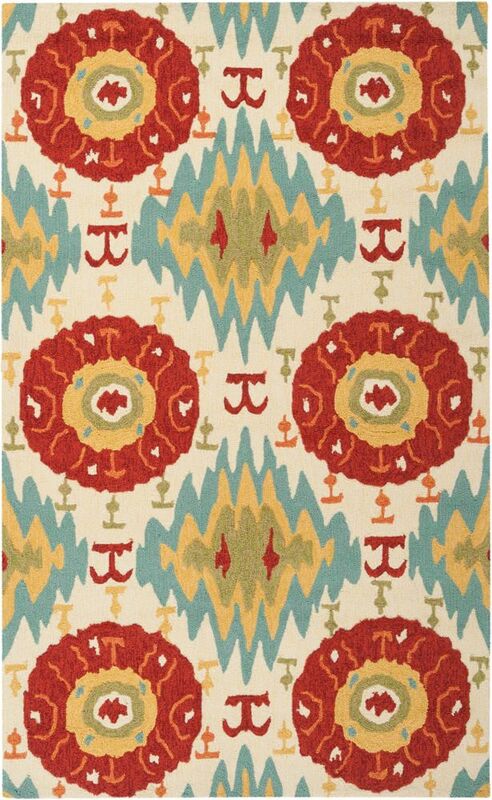 Place this contemporary Artistic Weavers Olimpo area rug in your home for a piece that makes a statement. Constructed to be an indoor/outdoor piece, this plush polypropylene material rug is sure to make a statement in your home. Since it is hand-made, you can trust the quality on this rug. This contemporary red rug has a lovely floral plants pattern for an impressive look. 8 ft. X 10 ft.6 in. Place this Artistic Weavers Anapaike area rug in your dining room when you need a splash of style. Contemporary dicor is made simple with this indoor/outdoor piece, made of plush polypropylene material. This hand-made rug makes long-term decorating easy. Maintain your modern home aesthetic with this floral plants patterned blue rug. This stylish Artistic Weavers Carmelo area rug is a high quality dicor option. Quality meets modern style in this indoor/outdoor rug made out of plush polypropylene material. This hand-made rug makes long-term decorating easy. Bring this floral plants patterned blue rug into your living spaces for a contemporary design aesthetic. Include this Artistic Weavers Durazo area rug in your hallway, dining room, or living room dicor for a taste of modern style. Decor done right with this indoor/outdoor piece, and its plush synthetic material. The hand-made construction of this area rug is both modern and comfortable. This floral plants patterned green rug makes a contemporary mark on your home's interior design. Improve the overall interior design of your living room, dining room, or hallway with this Artistic Weavers Gualla area rug. Complete your home's contemporary design with this indoor rug made of plush synthetic material. This rug is comfy, hand-made, and stylish. Make a bold statement with this solid patterned blue rug. Olimpo Red 8 ft. x 10 ft. 6-inch Indoor/Outdoor Transitional Rectangular Area Rug Place this contemporary Artistic Weavers Olimpo area rug in your home for a piece that makes a statement. Constructed to be an indoor/outdoor piece, this plush polypropylene material rug is sure to make a statement in your home. Since it is hand-made, you can trust the quality on this rug. This contemporary red rug has a lovely floral plants pattern for an impressive look.